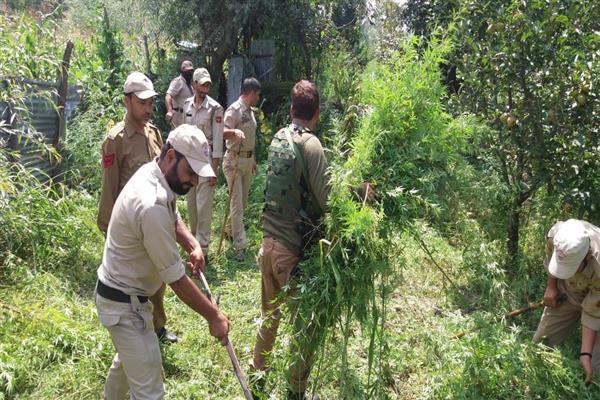 September 02 (KNO) : Continuing its drive against bhung cultivation, Anantnag police destroyed bhang cultivation spread on about 07 kanals of land at village Grund area of Aishmuqam Anantnag. On the directions of SSP Anantnag Shri Altaf Ahmad Khan, a police party headed by SHO Aishmqam under supervision of SDPO Pahalgam conducted a special drive against contraband cultivation. During the drive, bhung spread on about 7 kanlas of land was destroyed. Locals of the area have hailed this action of police and have wished to continue this drive in other parts of the district.